More than just the name of an excellent Polish beer, the Warta is the main river that runs through Poznan. The river is actually a tributary of the larger Oder (Odra in Polish) river, and runs for approximately 808 kilometers, making it Poland's third longest river. The basin area of the river is a good 54,529 square kilometers. Starting in Upper Silesia near Zawiercie, the Warta flows through Lodz, Poznan, and Lubusz until it empties into the Oder near Kostrzyn nad Odra. 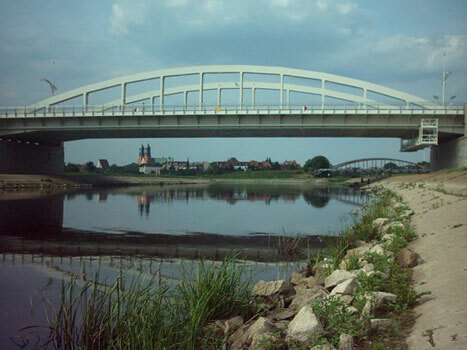 Above: A view of the Warta passing through Poznan under the St. Rocha Bridge. Warta doesn't flow through Lodz!! !